Standing tall in the Golden Triangle, Prince Hotel provides spacious residences with access to a fitness center and outdoor pool. Providing free parking, it has 6 dining options. Decorated with classic light wood furnishings, some rooms feature views of the iconic Petronas Towers and flat-screen TVs. Guests can enjoy the comfort of carpeted floors, a sofa and tea/coffee-making amenities. Relaxation options include soothing massages at the exclusive Mandara Spa or a game of ping-pong. The friendly staff can assist with childcare and business services. Sample fine Chinese dishes at the award-winning Tai Zi Heen restaurant. Wood-fired pizzas, Japanese favorites and a variety of international dishes are available at Hotel Prince. 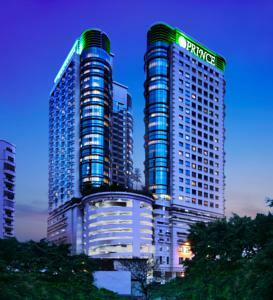 Prince Hotel Kuala Lumpur is less than a 5 minute walk from Pavilion shopping mall and other shopping and entertainment options. Rooms: Hotel Rooms: 608, Hotel Chain: Worldhotels. Free! All children under 6 years stay free of charge when using existing beds. Free! All children under 2 years stay free of charge for baby beds. All older children or adults are charged MYR 116 per person per night for extra beds. The maximum number of extra beds/baby beds in a room is 1. Supplements are not calculated automatically in the total costs and will have to be paid for separately when checking out.